I live in the Northeast but I see flowers all year round. How is this so? 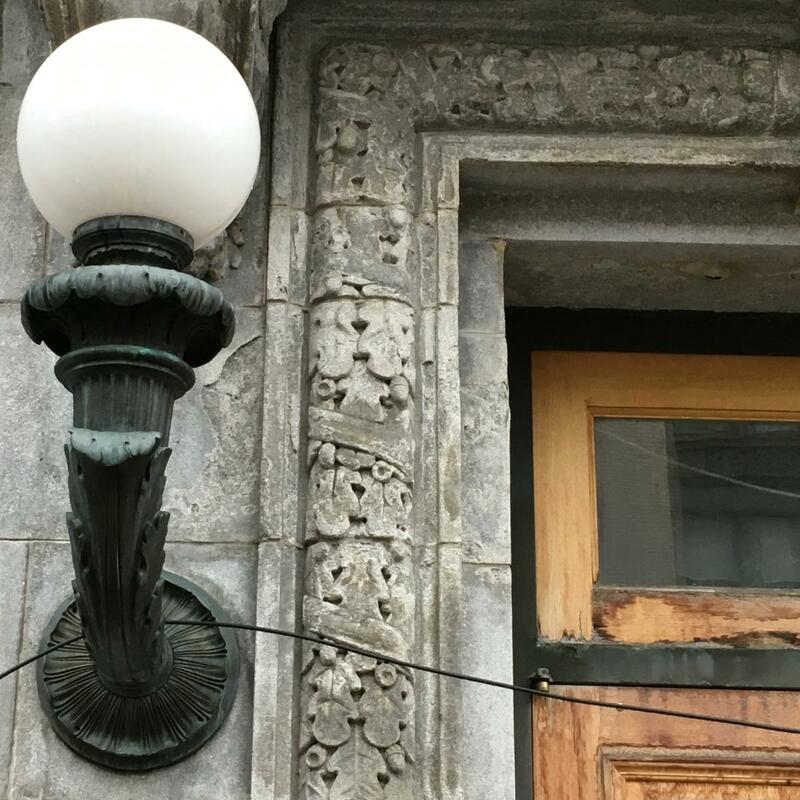 It’s because of the best building bits, those stone and cast iron florets that adorn dozens and dozens of buildings here. As an artist, my people are the people who make things, who get hired for the skills they alone possess to add flourishes that enliven everyone else’s life. I once knew a woman who supported herself solely by painting artificial skies for the wealthy. She would take trains all over the region with her brushes and sponges to fill rooms with clouds that never will rain. So much work for hire is fundamentally anonymous, and as time passes we lose the names, if we ever had them, of most artists. But their work lives on every time someone sees it, and appreciates it. It is a funny kind of immortality, as funny as an artificial cloud indoors. I challenge you dear readers to find ALL the best building bits, starting with those I enclose here today as a trail to get you started. 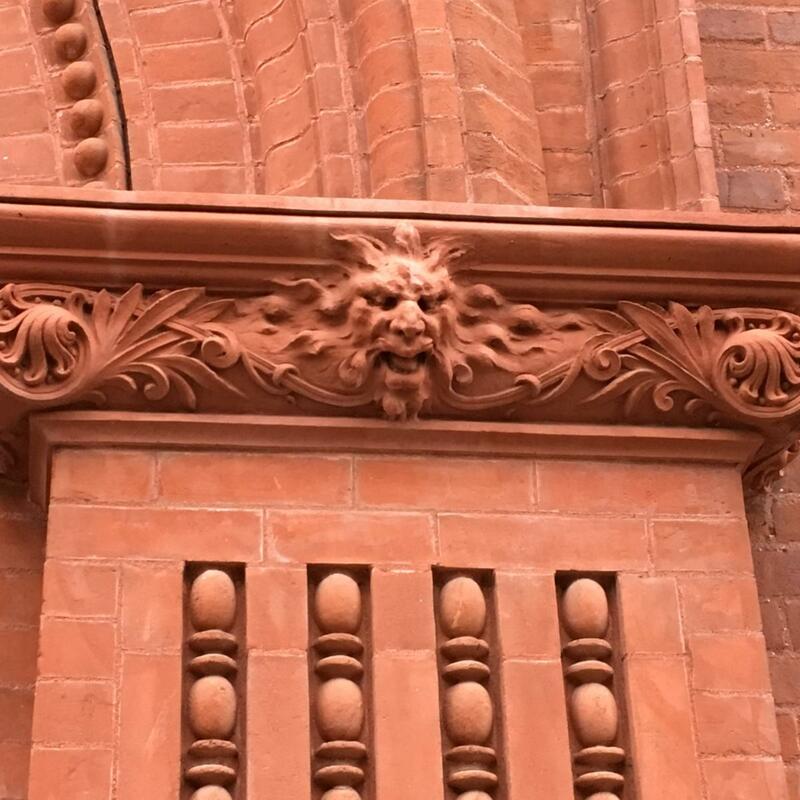 There need be no care for whether you are conversant in all the words for ornamentation (cartouche, cornice) or know which architect or notable designed or commissioned the building. We’re looking at the bits today, the little gestures made by artists whose names we will probably never know. Collectively, a small army of creative people, they made Newark a wonderful place to take walks in. 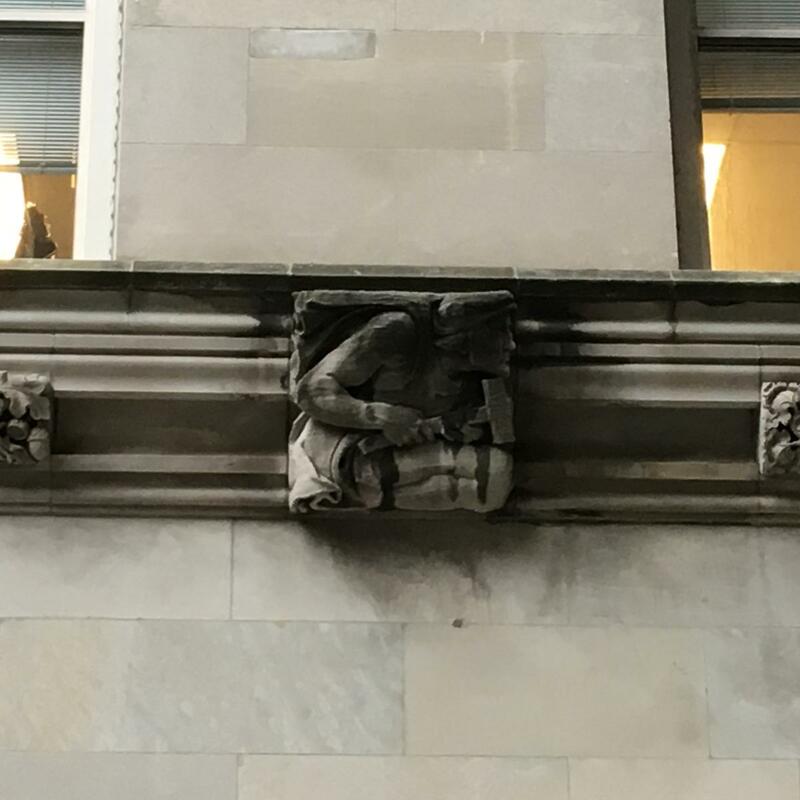 The city’s scale and accessibly makes it ideal for flaneur type adventures; it’s actually possible to walk and sometimes even bike while taking in architectural details. The hunt: all but two bits are in the downtown area. I note them in passing for the truly determined who want to stray briefly to the Ironbound, where there stands one of America’s first public bath houses. It looks very much like an adorable miniature factory, with diminutive smokestacks, but it was created to offer what I imagine to be surprisingly luxurious hot baths for the workers who lived nearby. There is something about it now that reminds me of New Orleans, it might be the purple shutters. Men and women bathed on different days, and based on beautiful reference images on file at Harvard University, it is almost entirely unchanged, though no longer open for it’s original purpose. 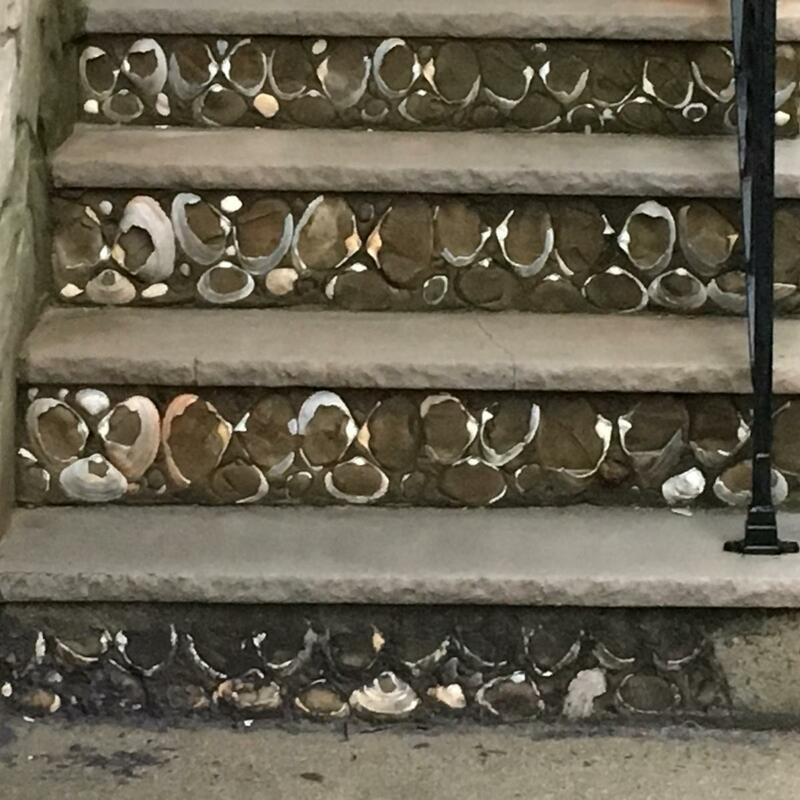 The memory of water persists as I pass various homes where hundreds of seashells have been pressed into wet plaster to make humble but somehow exotic ornamentation. There used to be quite a few homes sided like this in the neighborhood but it seems to be falling out of fashion with the current generation. As with much style, I imagine the next generation will rediscover it and start going mollusk mad like a pack of etsy-crazed mermaids. 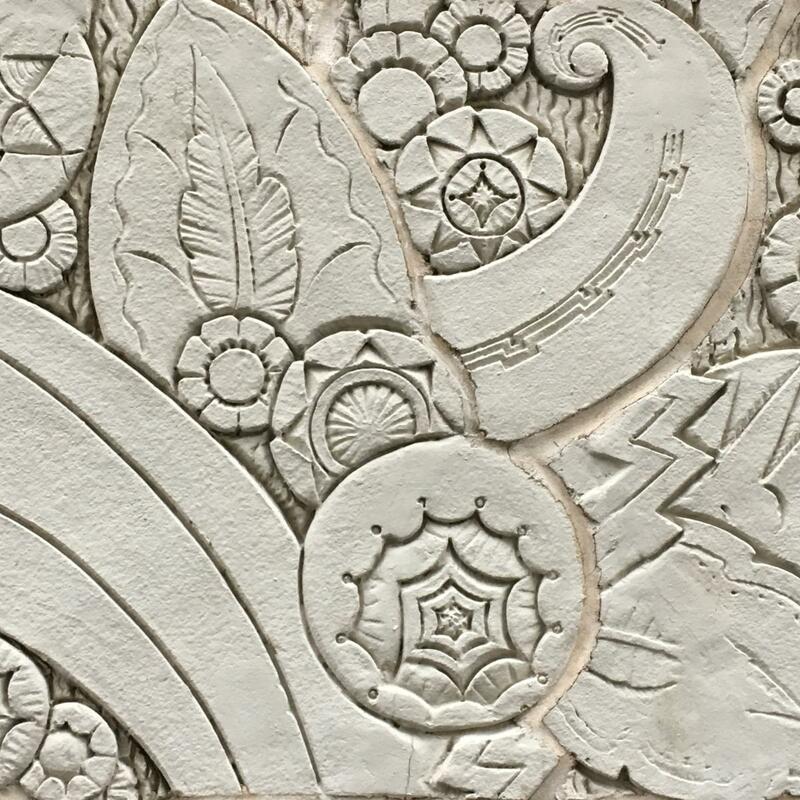 Speaking of seashells, much of local ornamentation is carved from limestone (aka compressed prehistoric sea critters), meaning that it is relatively “mortal” in the geologic sense. The carved oak leaves (1) you see are probably not as crisply defined as they were the day they were made, rainy weather slowly but surely wears limestone away. Loving building bits means thinking about time in various ways; a carved stone ribbon will wave in a timeless wind while all of our days go by, cat memes and hashtags going in and out of vogue. The goddesses (2) lining the top of a building seem to have run off in a few instances- I wonder what happened? I presume they are goddesses- how many women do you know with winged helmets? Though perhaps that will be a thing soon. Local artist LNY (AKA Lunar New Year, Layqa Nuna Yawar) has done some amazing work that borrows from these visual traditions, and like many an artist before him, works with friends and colleagues as models. Perhaps the model for these stone goddesses was a friend, a lover, a child? Her name is lost to time but not her face. A personal favorite are the deco, geometric, somewhat tropical flowers (3) that adorn two different buildings downtown. They are a little different than anything else around, and bring a Miami Beach vibe to even a cold winter day. They are also flat rather than protruding, so you could make a rubbing of them if you bring charcoal and paper. Just saying. Terrifying yet gorgeous flames (4) and heavy metal looking chimera-type creatures, of distinctive red stone, nearby. A modest carved banner, with the letter W (5). 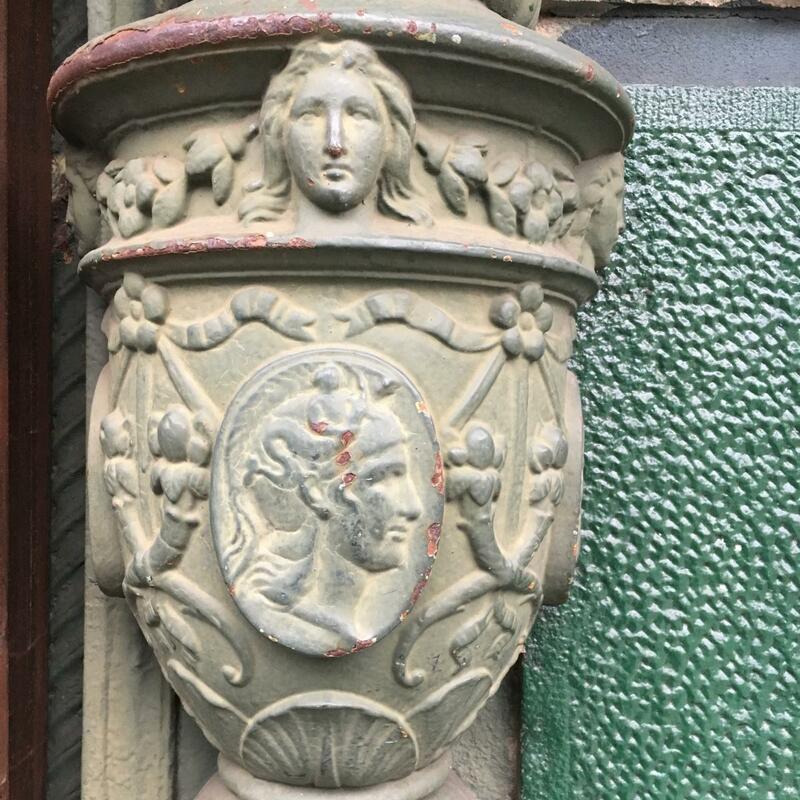 The totally over the top explosion of Greek mythological figures, currently painted green that adorn every square foot of a local Mosque (6), and finally, a somewhat poignant, maybe self portrait of one of my people, the artists, with a stone carving tool in his hand (7). Have fun finding these building bits, and I am sure you will find many more besides.